Volunteers of America Massachusetts President and CEO Thomas Bierbaum wields the scissors flanked by Mayor of Somerville, Joseph Curtatone, (left) with Congressman Michael E. Capuano representing the 7th district of Massachusetts as the ribbon is cut. Somerville, MA, August 8, 2013 /3BL Media/ – Homeless military veterans in the metropolitan Boston area now have a greater chance to get back on their feet with a roof over their heads and access to a wide array of supportive services with the dedication last night of the new Volunteers of America Massachusetts Bay Veterans Center (MBVC) in Somerville, MA. The recently completed 15,000 square foot, three-story brick building has 22 transitional and seven permanent units of housing, and will provide services that help homeless veterans rebuild their lives. 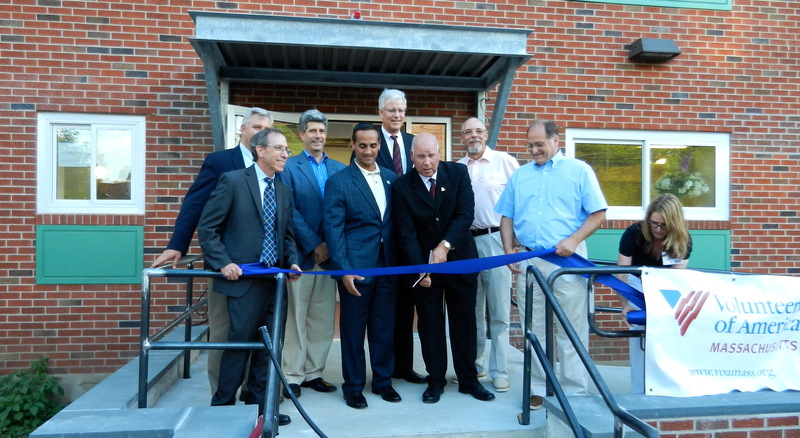 Thanks to generous funding from Constant Contact’s EcoAd advertising through CBS EcoMedia Inc., the new Massachusetts Bay Veterans Center received a state-of-the-art Energy Recovery Ventilator (ERV) system. Recovery ventilation helps to lower energy demand by recovering and reusing the heat energy that would otherwise be lost when exhausted. In the summer months, exhausted air is used to cool and dehumidify the supply air. Not only does the ERV cut C02 emissions from the new facility, it also generates significant energy cost savings, which will make more money available for the MBVC’s services and on-site support. Volunteers of America Massachusetts President and CEO Thomas Bierbaum hosted the new building’s dedication, held under a tent adjacent to the new veterans center. Special guests included Congressman Michael E. Capuano representing the 7th district of Massachusetts; Aaron Gornstein, Undersecretary for Housing and Community Development, Commonwealth of Massachusetts; Coleman Nee, Secretary of Veterans’ Services, Commonwealth of Massachusetts; Joseph Curtatone, Mayor of Somerville; Ed Hjerpe, President and CEO of Federal Home Loan Bank of Boston; and Reed Bundy, Senior Manager of Corporate Social Responsibility and Internal Communications at Constant Contact were also on hand to enjoy the dedication festivities, tour the new building and see the energy recovery ventilator system. Using the energy recovery ventilator will recapture up to 75 percent of the MBVC’s exhaust air heat for reuse. This reduces the cost of heating and cooling the supply air due to the transfer of heat between the different air streams. The system has been designed to provide direct supply air to both the center’s corridors and each individual unit, generating substantial energy savings and cutting 10,171 lbs. of CO2 emissions annually. Constant Contact wrote the book on Engagement Marketing™ – the new marketing success formula that helps small organizations create and grow customer relationships in today’s socially connected world. More than half a million small businesses, nonprofits, and associations worldwide use the company’s online marketing tools to generate new customers, repeat business, and referrals through email marketing, social media marketing, event marketing, local deals, digital storefronts, and online surveys. Only Constant Contact offers the proven combination of affordable tools and free KnowHow, including local seminars, personal coaching and award-winning product support. The company further supports small organizations through its extensive network of consultants/resellers, technology providers, franchises and national associations. Volunteers of America, Massachusetts is a nonprofit organization committed to helping change lives. Our work focuses on providing care and services to those most in need and to those who are most vulnerable. We see the potential in everyone and help them to achieve what they thought was impossible. Our programs touch the lives of veterans, youth, adults and youth in recovery from addiction, elders in need of housing and assistance, and those in need of mental health services.